"One mechanic I have used in the past is when a pretty face gets randomly selected, it's a good thing. You are happy to see her instead of being upset to see a personnel selected." This was used as a bit of a back-up, but still shows up a few times in the set. A few examples of this have already been seen. But should the pretty people get all the love? I say, "No!" So what do Mudd's Women do in the game? Easy. You give the drug (discard a card from hand) to some uggo (name a personnel) and then when that person starts attracting some attention (randomly selected by a dilemma), you get some more of what you already have (2 more counters next turn). What decks work the best with such a strategy? Well, any time you can remove other personnel from the random selections, you have a winner. 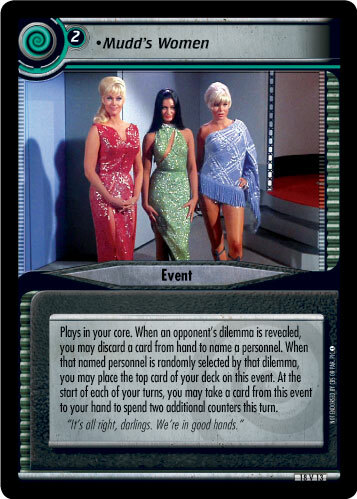 A Romulan Wariness deck would be a good start. Not to mention a Captain's Log deck. And why simply stick to the U.S.S. Defiant? By my count, the Enterprise, Fortune, I.S.S. Enterprise, Terix, U.S.S. Enterprise, U.S.S. Enterprise-D, and U.S.S. Voyager all can have four Commanders (with Khan Noonien Singh and Martia) that you can build into a deck. Then, you only have to find a one-cost, non-unique personnel that you wouldn't mind having in multiple and name that personnel. If they get tagged by a dilemma or two, well, that's what cannon fodder is for. Why not get something out of it too? While we're at it, why not name one of the already pretty faces? Jadzia becomes absolutely goddess-like when she's drugged up on pretty pills... and not only cycling your cards from hand, but also getting you free counters. My personal favorite is Leeta (Union Member)...with an Alien Gambling Device to get even more bang for my buck. Here's to more pretty faces in the future.